Pulse modulation may be used to transmit analog information, such as continuous speech or data. It is a system in which continuous waveforms are sampled at regular intervals. Information regarding the signal is transmitted only at the sampling times, together with any synchronising pulses that may be required. At the receiving end, the original waveforms may be reconstructed from this information regarding the samples. The resulting output has negligible distortion. 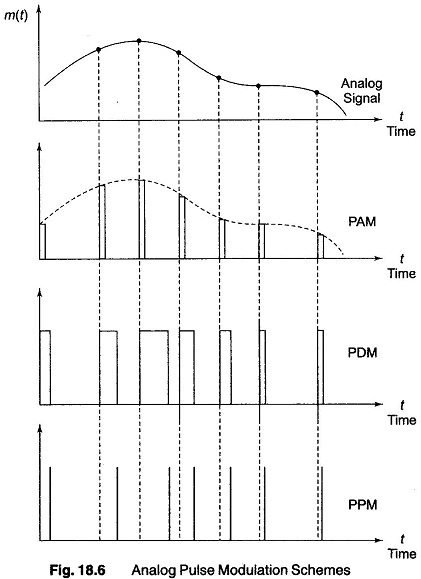 Pulse modulation may be broadly subdivided into two categories, analog and digital. In the former, the indication of the sample amplitude may be infinitely variable, while in the latter a code which indicates the sample amplitude to the nearest predetermined level is sent. Pulse amplitude and pulse time modulation are analog, while both pulse code modulation (PCM) and delta modulation are digital. All modulation systems have sampling in common, but they differ from each other in the manner of indicating the sample amplitude. In the PAM, the baseband signal modulates the amplitude of a pulse train which is spaced at regular intervals and has fixed time slots. Rather than varying the pulse amplitude, alternative modulation schemes vary either the pulse intervals, called Pulse Position Modulation (PPM), or the duration of the time slots, called Pulse duration (Width) Modulation (PWM). Figure 18.6 shows various analog pulse modulation waveforms for the same message signal. In PDM, the pulse width is proportional to the amplitude of the modulating signal. In PPM, the pulse delay from some reference point is proportional to the amplitude of the modulating signal. In both PDM and PPM information is conveyed by a time parameter, or the location of the pulse edges. Thus, these modulation types are referred to as pulse time. In PAM and PDM, the sample value equals zero, usually represented by a non-zero amplitude or duration in order to prevent missing pulses and to preserve a constant pulse rate. This is important for synchronization purposes when time division multiplexing is used.